My work explores self-portraiture as subject. To look at oneself is a starting point in navigating the world around us. All my work stems from a desire to explore the experience of looking and drawing, even when the works become sculptural. I am interested in how my work can have two and three-dimensional attributes and often line is a map of how I see as well as a description of what I see. 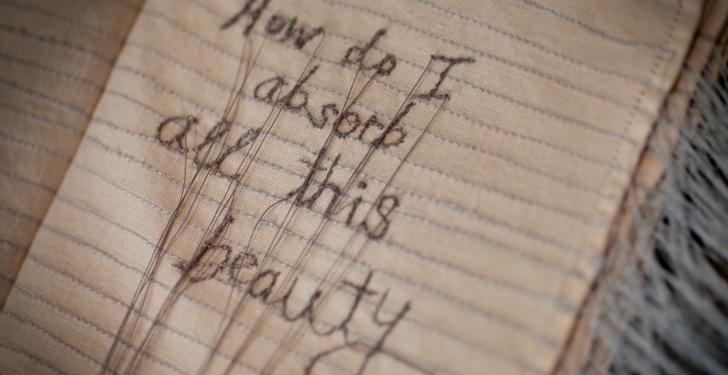 Using a physical line such as hair, plant matter, wire or thread is often how the line becomes both object and image. I explore the many facets of autobiography: myself as body, as a reflected image, as genetic information, as a muse and as a boundary between my outer and inner worlds. Lately I have been looking at animals and their behavior to try to understand myself. Many of children's first lessons and stories are about animals emulating humans. It is the reverse I find I am now learning from. Instinct, empathy, hunger, desire, fear, and self-protection are all traits I look to understand in animals and thus myself. I am interested in how I am part of nature and not apart from it.